Since the 2012 presidential debates have just concluded, I thought I’d do a bit of a link roundup on things I think everyone should read to get a bit more holistic sense of those debates (and the way they were seen by partisans). The stories are listed chronologically, starting with the previews before the debates and ending with some final roundups looking back. I’ve provided some meager analysis about what I think is worth looking at in these articles, so get excited! Before the links though, a quick housekeeping note. I know this feature has been kind of spotty in the last couple of months (it’s midterm season here at the University of Chicago). In the interest of making sure I stop giving the esteemed founders headaches, and that what I do write here meets certain standards, Debate Night is going to move to a monthly schedule every second Monday, beginning on Nov. 12. Hopefully I’ll see you there as we continue on through the presidential debates that have happened since I was born. “Slugfest.” James Fallows, The Atlantic. Sept. 2012. James Fallows’s exhaustive look at previous presidential debates and the debating histories, strengths, and weaknesses of both candidates was excellent pre-debate reading for anyone looking to handicap the candidates. It’s also great post-debate reading if you want to get a sense of how the debates were perceived before they happened and what sorts of expectations commentators had for each candidate, knowing now whether or not they were accurate. Among other things, Fallows notes that Mitt Romney was burned by high expectations in his 1994 debates against Ted Kennedy when running for Senate from Massachusetts, foreshadowing the “expectations game” played between the 2012 campaigns that led Romney to be perceived as the winner early in the first debate. In the closing paragraphs, Fallows identifies Barack Obama’s best strategy (rightly, in hindsight) as angering Romney into going off-script—an observation borne out by the second debate’s testier, rougher Romney. Fallows points to 1980 as the worst possible model for the debates for Obama, since it confirms that all a challenger has to do in the first debate is appear relatively presidential and capable of doing the job. As we saw then, Ronald Reagan simply showing up was enormously effective—even if Reagan hadn’t had the advantage of his disarming performance, he still appeared like a reasonable enough alternative to Jimmy Carter that he was widely perceived to be the winner. That certainly seems like something Romney has accomplished—I’d argue that a lot of his post-Denver bounce has been from voters who simply realized he would be an effective president and didn’t like Obama enough to want a second term. 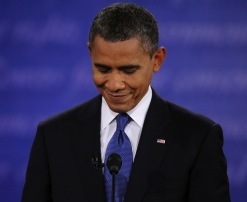 “Obama’s Big Whimper: Four Big Surprises From the Denver Debate.” Michael Medved, The Daily Beast. Oct. 4, 2012. If there’s any place to take a look at conservative reactions to the debates, it’s after their candidate’s victory in the first debate. Conservative talk radio host Michael Medved’s breakdown of the Denver debate says a lot not only about the way conservatives have perceived the race, but also about what it means for people to write post-debate pieces in the present day. For starters, it’s remarkable how shocked Medved seems that Romney was so successful. The piece is structured as four “surprises,” each of which is a different thing that Romney somehow managed to do right. Renewed enthusiasm on the right seems traceable back to this debate, when a candidate many had written off as an incompetent who would doom them to another four years of Obama showing his teeth. That three out of the four “surprises” are clear examples of Romney potentially occupying image space previously held by the president (as the candidate of conciliatory bipartisanship, for example) also says quite a bit about the Romney campaign’s strategy in the debate, which effectively shifted almost to the left of the president. From a structural perspective (and this one is for all you straight-up TV criticism nerds), the piece, as well as countless others, reads almost the same way you would expect a recap of an episode of television. Medved (and countless others) summarizes the events of the debate, even while assuming the reader has seen it, and uses it as a springboard to enforce his own interpretation of what happened in the debate. To some extent, these “surprises”—like all debate analysis, and like a lot of TV criticism—hinge on the way viewers perceive the objective events of the debate/episode. “No Guarantee of Obama Rebound in Second Debate.” Nate Silver, The New York Times. Oct. 16, 2012. This one even includes a clip of the most famous moment of the 1992 debates! We’ll get to that contest next time, but here Nate Silver uses the historical precedent of George H.W. Bush’s disastrous second debate to extrapolate to Obama’s second debate performance. Silver argues that the 1992 campaign, in which Bill Clinton rebounded from a mediocre first debate to gain on Bush at an even faster rate, suggests an Obama rebound. That seems accurate based on the latest polling, but it’s also worth noting how Silver uses both the specific moments that tend to be analyzed (as well as the broader notion of performance in the debates) alongside historical polling data. That’s something I’d hope more commentators did after the debates with something other than instant polls bolstering either side. The numbers since that debate (and the third) have certainly suggested that’s been the case. 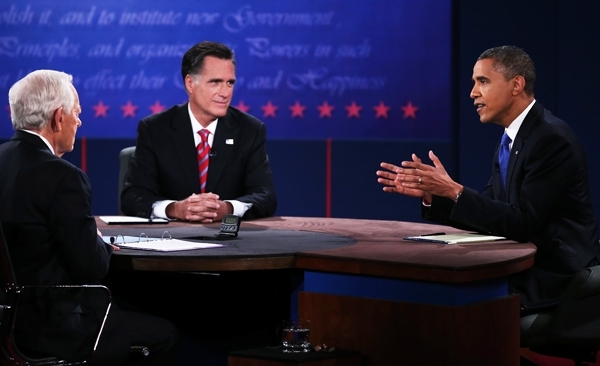 The closest there’s been to a single moment seized on throughout the 2012 debates has been Romney’s attempt to “gotcha” Obama on his administration’s response to the events in Libya and Candy Crowley’s subsequent live fact check. Though some have complained about the interjection, the moment certainly hasn’t played will with those unfamiliar with the intricacies of the Obama administration’s response to the Libya crisis—in fact, the audience at Hofstra applauded Crowley. “Obama Wins The Why-Are-We-Debating-This? Debate.” Jonathan Chait, New York. Oct. 22, 2012. Jon Chait’s analysis of why Obama won the third debate is certainly accurate from a substantive perspective—most of the arguments to the contrary simply centered on attacking the president’s demeanor as too aggressive, a charge voters didn’t seem to embrace. But the crucial observation Chait makes (one that is indicative of the differing perspectives on the debates) is that nowhere did Obama use his debate victories to declare unequivocally that Romney was not qualified to hold the office. The post is prescient—in recent days, the Obama campaign has stepped up character attacks on the Romney campaign’s policy shifts. The president has even accused Romney of being a “bullshitter.” We’ll see whether that strategy works, but the Obama campaign’s recent strategy (as well as the president’s course correction in the latter two debates) implies that the campaign has been paying at least some attention to the lessons of the debates. Even if David Axelrod isn’t obsessively reading Jon Chait, it does seem like they reached the same conclusion and have acted accordingly. And isn’t that all a pundit wants?